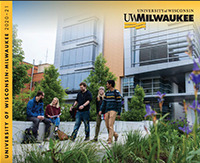 Peck School of the Arts students work and intern professionally with 100% of Milwaukee’s United Performing Arts Fund (UPAF) music organizations, professional theatre and dance companies, film festivals, as well as leading art museums & galleries, and creative agencies. Whether your interest lies in performance, curation, education, arts administration… our students benefit from access to a thriving creative metropolis while studying in the Cultural Capital of Wisconsin. Speak to your faculty mentors and advisors about critical learning experiences available to you outside of the classroom.